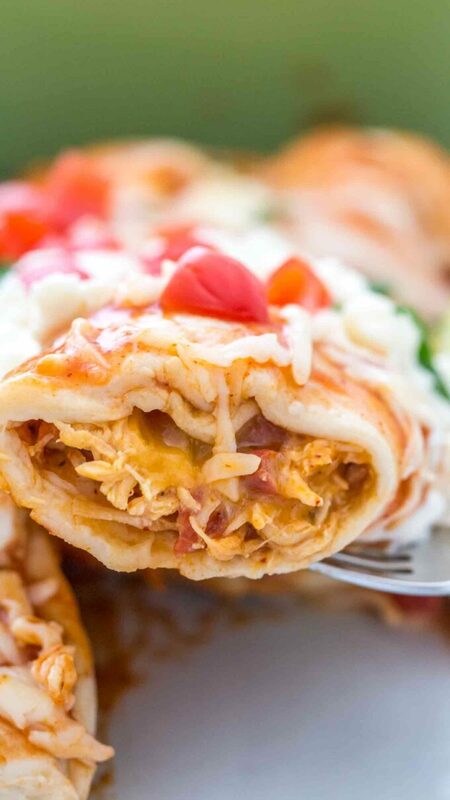 Chicken Enchiladas are delicious and easy to make with chicken, homemade enchilada sauce, Mozzarella, and Cheddar cheese. This dish is rich and creamy, with Mexican inspired flavors and will be ready in no time. Perfect for any occasion and during any day of the week! You can serve this meal on its own, or you can add side dishes like the Roasted Brussels Sprouts or the Chunky Mashed Potatoes with it. No matter what you are serving this dish with, this will be the perfect recipe to make. Chicken Enchiladas are a perfect comfort Mexican food that is loved by everyone. Since we enjoy Mexican food, we make this dish at least twice a month. Also, we use our homemade enchilada sauce in this recipe, which is a really great complement to this recipe. With shredded chicken, enchiladas and some chilies, this is the kind of meal that you can make at all the time. It is a simple recipe to make even for beginners. It’s a great way to impress family and friends. 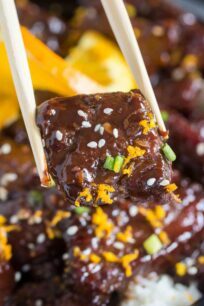 The great thing about this homemade recipe is that is easy to change it based on your preference. For example, you can always replace the chicken with veggies and have a vegetarian meal. 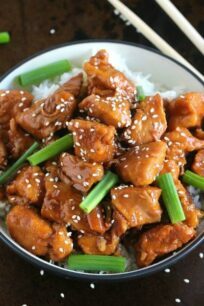 Or if you prefer beef instead of chicken, simple swap the meats. 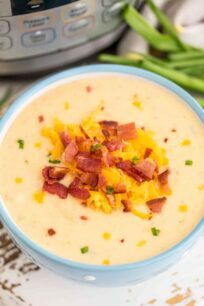 Similarly, use any of your favorite cheese for topping. Yes, this dish can be made ahead of time. They can be made up to two days ahead of time. However, you need to cover and refrigerate them until ready to serve. Before serving, simply put them in the oven to bake. You should avoid storing them once baked because the enchiladas will become soggy. For best results, we recommend having the enchiladas in the oven between 15 to 20 minutes at 350 degrees F. This is the part where most people are making a mistake. They are baking the enchiladas for too long in the oven, which makes them soggy. Therefore, try to check on them after the 15 minutes mark. This is totally up to you. We prefer to use corn tortillas over flour once whenever we cook a Mexican inspired dish. We love the taste of corn tortilla better, plus they tend to be healthier. Flour tortillas are usually made of refined flour and lard, which make them less attractive for us. Using flour tortilla might also result in a more doughy texture for the enchiladas, which we try to avoid. But this is not always the case, and if you love flour tortillas, by all means, uses them. First, we recommend using high-quality tortillas. Or, if you can make them yourself, it’s even better. We usually get them at Whole Foods, and they work pretty well. Another thing you could do is to fry them shortly in olive oil. This will soften their texture. Similarly, you could just brush the enchiladas with olive oil. One technique that was brought to our attention was to wrap them in a paper towel (preferably wet one) and microwave for 10-15 seconds. In general, we do not recommend freezing them. As stated above, if the chicken enchiladas are already cooked, freezing will result in them getting soggy. However, you can still freeze them; just keep this in mind before doing so. Use a freezer-safe dish container. It is possible to freeze the whole dish or divide it into smaller dishes. Cover the container tightly, and freeze for up to 3 months. When ready to eat, simply take them out of the freezer and bake them in the oven at 350 degrees F for about 10 minutes, or until warm. You can use a combination of cheeses for this recipe. The more cheese you use, the better it will taste. We love using 2 cheese mixes for a creamier and cheesier taste. Also, serve the chicken enchiladas as is, or with some Spanish rice, or veggies on the side. With this dish, you don’t necessarily need to use chicken. You can substitute it with beef, pork or turkey. For a vegetarian option, use tofu, beans, or your favorite veggies. 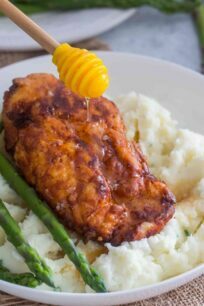 Chicken Enchiladas are delicious and easy to make with chicken, homemade enchilada sauce, Mozzarella, and Cheddar cheese. Place a large skillet over medium-high heat and once hot add oil. Season chicken breast with salt and pepper and add to the skillet. Cook on each side for about 6-7 minutes, until no longer pink in the center. Transfer cooked chicken to a plate, cover with foil and set aside. To the same pan, add diced onion and cook for 1 minute. Add minced garlic, stir and cook for another minute. Add corn, beans, and chiles. Add chipotle peppers if using. Stir and cook for another minute. Add diced tomatoes and tomato paste, saute 1 minute. Add cumin and paprika. Pull chicken breasts apart into shredded strips and add to the pan, stir to combine. Microwave tortillas on high for 30 seconds to soften them. Coat the bottom of 2 (9 by 13-inch) pans with about 1/2 cup of enchilada sauce. Add about 2 tablespoons of enchilada sauce to each tortilla and lightly coat. Spoon 1/4 cup chicken mixture onto each tortilla. Sprinkle the mixture with Mexican blend cheese. Fold over filling tightly, and place 8 enchiladas in each pan seam side down. Top with remaining enchilada sauce and sprinkle Mozzarella and Cheddar cheese on top. Bake for 15-20 minutes in the preheated oven until cheese melts. Garnish with cilantro, sour cream, and chopped tomatoes before serving. Who doesn’t love a good chicken enchilada recipe. It makes a bunch so there are always leftovers for my family. Plus if I am feeding a crowd they can be made ahead of time. Chicken Enchiladas are a favorite at my house. My dad loves them so I always make sure I make them when he comes to visit. Next time, I’m going to try your recipe. 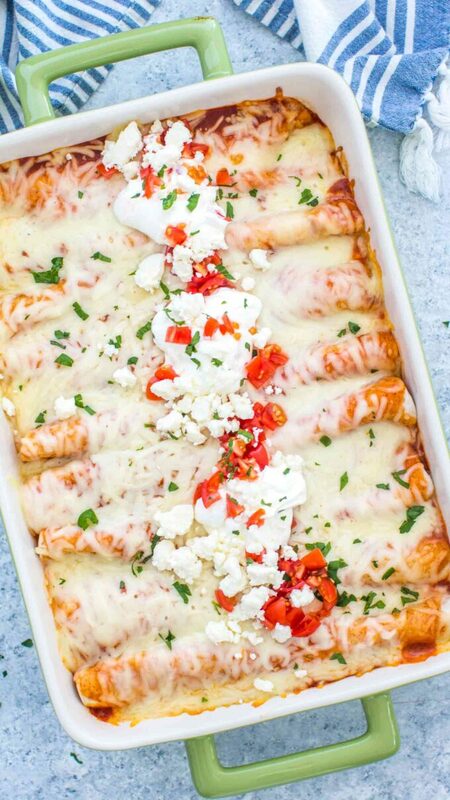 Your enchiladas look amazing. 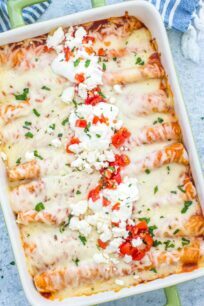 omg chicken enchiladas are a huge staple in my family- my kids seriously cant get enough of all of it so im def have to try your recipe and see how they do- it looks SO yummy! Enchiladas are my fave! 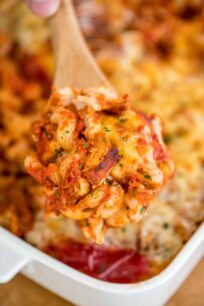 I have a bunch of shredded chicken in the fridge so I may just make this tonight! I just love enchiladas. 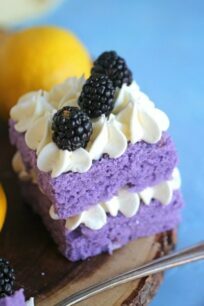 I really need to make some. It’s been ages since I’ve had some and they are SO good. Oh yum! I make an enchilada casserole, but I have always used canned sauce. Your sounds delicious! And, homemade is always better. THis is one of my kid’s most requested meal choices when I ask them what they would like me to make. You recipe sounds very delicious and I may have to give it a try in place of my old standyby one. Chicken Enchiladas are such delicious comfort food. They’re warm and delicious especially on a cold day. Great idea to make ahead and freeze them. CHicken enchiladas are one of my fave meals. I love the way you prepared this! The pictures are mouth-watering!! I don’t eat meat anymore, but I can totally make this for my family. They would love it! 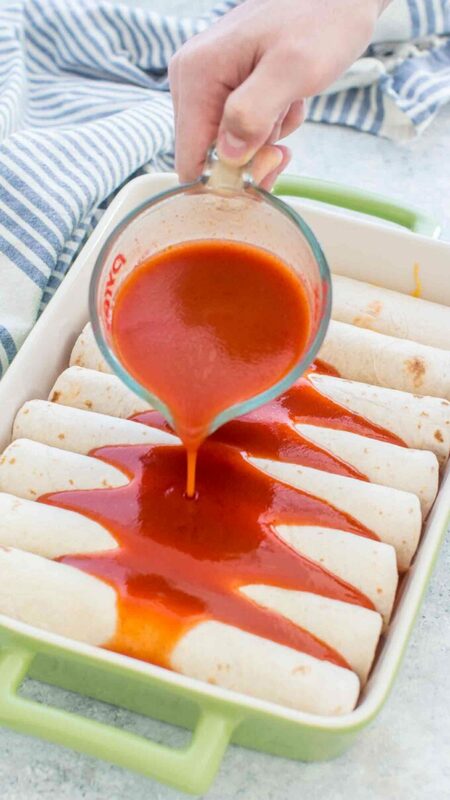 Your family will love these, especially with the homemade Enchilada sauce. I needed to see this. One of the main dishes I used to make when my husband and I got married 18 years ago was enchiladas. I don’t ever think of it anymore so I haven’t made them in years. I am going to cook these this week!!! 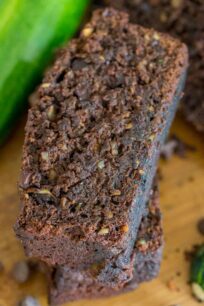 You should surprise him with this recipe! I love corn tortillas for enchiladas for some reason. I just favor them. 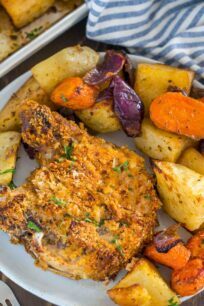 This recipe looks good, I want to give it a try with my family! Love corn tortillas too, the texture is so good! That looks good! !Chicken Enchiladas is one of my husband’s favorites. He’s such a fan he could eat enchiladas everyday. I can eat them every day too! We love making enchiladas at home! Normally we do just cheese or cheese and beef. Going to try this one out next week for the family. 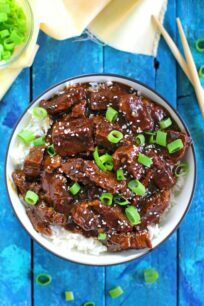 Love making these with beef as well. I LOVE chicken enchiladas and I rarely make them for myself! I need to try your recipe soon! I love a good enchilada recipe. 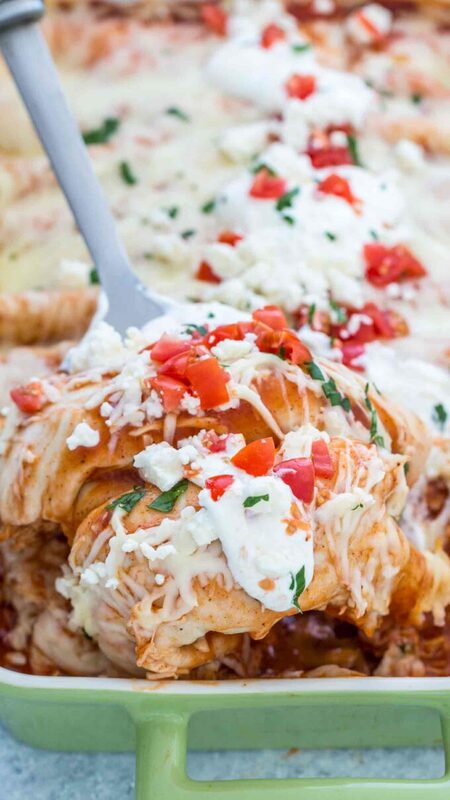 These chicken enchiladas look like they should go on the meal plan. These look so good! I don’t eat that much meat anymore, but I still eat it occasionally. I’ll be making these in the near future.